The Littoral Acoustic Demonstration Center (LADC) was founded in June 2001 as a consortium of scientists from universities and the Navy. Initially it consisted of the University of Southern Mississippi (USM), the University of New Orleans (UNO), and the Naval Research Laboratory at Stennis Space Center (NRL-SSC). The University of Louisiana at Lafayette (UL Lafayette) has since become a part of the group. Its formative funding was provided by the Office of Naval Research (ONR). LADC was formed to conduct ambient noise and marine mammal acoustic measurements and analyses in shallow water. The original concentration of LADC research has since been broadened to include airgun calibration measurements. LADC underwater acoustic measurementshave all been performed using Environmental Acoustic Recording System (EARS) buoys developed at Stennis Space Center by the Naval Oceanographic Office (NAVOCEANO). NAVOCEANO has provided technical advice and guidance throughout the existence of LADC. Major experimental exercises have included two sets of measurements with three separated bottom-moored hydrophones (EARS buoys) in the Gulf of Mexico during the summers of 2001 and 2002, two sets of Mediterranean Sea measurements, the first in the Corsica-Ligurian Basin (summer 2002) and the second in the Genoa Canyon (summer 2003), and airgun calibration measurements in the Gulf of Mexico in the summer of 2003. Details of these experiments can be found by clicking Experiments in the menu. Ambient noise analyses have included comparing the noise measured during the nearby passage of major storms (tropical storms Barry and Isidore and hurricane Lili) to predicted noise levels for various wind speeds. Analyses have also been directed toward the development of forward prediction algorithms for ambient noise based on measurements. Marine mammal goals have included the detection, identification, and tracking of marine mammals using bottom-moored hydrophones and have thus far concentrated on sperm whales. In addition to using existing detection algorithms, a new detection algorithm for sperm whale clicks has been developed. Methods have been developed for the identification of individual sperm whales based on their codas and echo-location clicks. 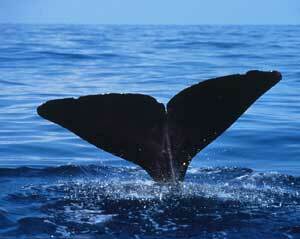 Analysis of sperm whale activity levels has been performed. This has included investigation of the effects of ship noise. For the airgun calibration performed in the summer of 2003, a seismic exploration vessel, the Kondor, was used to provide airgun shots along predetermined tracks at given offsets from an EARS buoy, including one track almost directly overhead. Sensitive and desensitized hydrophones were employed to make the measurements without clipping. These results have been analyzed and reported, and analysis is continuing. Publications describing the above can be found by clicking Publications in the menu.